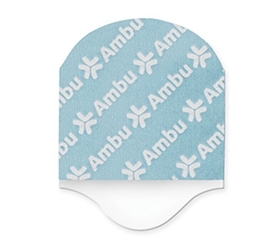 The Ambu® White Sensor Resting Tab Electrode - item #0615M, item #EM0615M is a skin friendly, solid gel electrode with a center tab connection for great adhesion and reliable recordings. This electrode can remain on the patient during x-ray and MRI procedures. The Ambu® White Sensor Resting Tab Electrode - item #0615M, item #EM0615M is medium sized, 26 x 37mm and can be used on most patients. It has a polymer backing material and is PVC free. It conveniently has 10 electrodes per strip, and sold 100/pouch, 500/box and 5000/case.